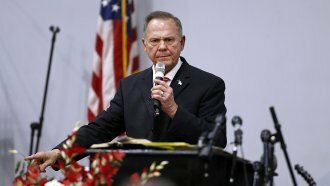 In a briefing Tuesday, the White House called allegations against Republican Senate candidate Roy Moore "concerning" but reiterated its support. Two things that seem to contradict each other actually can be true. "The allegations are concerning, and if true, he should step aside," White House press secretary Sarah Sanders told reporters Tuesday. She was talking about Roy Moore, the embattled U.S. Senate candidate from Alabama. At least eight women have accused him of sexual misconduct. Some of those women say they were teenagers when Moore pursued them. We should note Moore denies any wrongdoing. Still, it is presumably true the White House views the allegations against the Republican in the race as troubling. Yet it's also true that it would rather see him win. On Monday, President Donald Trump tweeted, "[W]e need Republican Roy Moore to win in Alabama." "The president ... decided that it was better to have somebody that supports his agenda than a Democrat that doesn't." Which got some headlines, but really, it's the same thing the president himself has been saying of late. Moore's denial of wrongdoing has ultimately been enough to keep the support, not just of the White House, but of the Republican National Committee. We just learned the RNC decided to reinstate its financial support of Moore's campaign. Alabama voters will decide in just a week, and Moore is only slightly up in the RealClearPolitics average of polls. The race could come down to wedge issues like abortion — which Moore is against, but his Democratic opponent supports.